Conforming, in many ways, is choosing the path of least resistance; but it takes courage to face the battle…even if you have to face it alone. Understanding that even when we think we’re alone, we’re not because The Lord is with us always. Pastor Sebastian, I like your comments and suspect that there is more behind what you write than just the few lines you wrote. 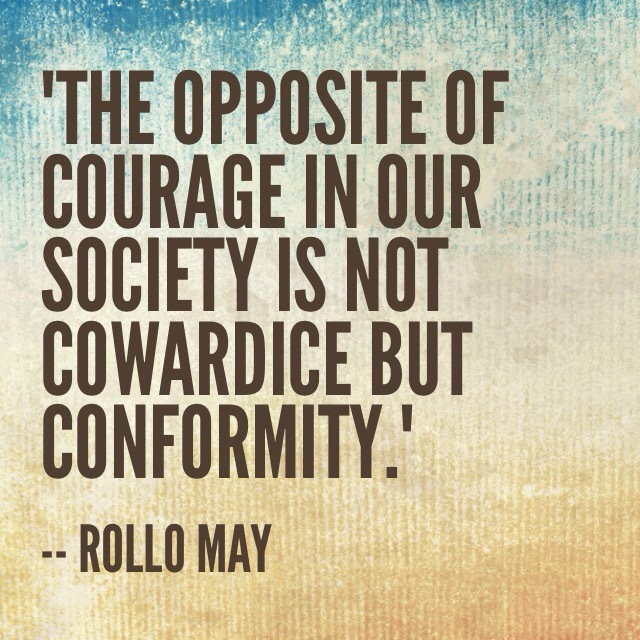 I would love to hear more about your faith-observations on courage and conformity. Thanks. Thank you Pastor! I “suspect” you are right. That was just a blurb of something on my heart that I will be expanding upon here soon…so please stay tuned. Blessings! Great message and I love the quote you used, never heard that one before. Thank you James! Yes, I love it too. I have that among the many notes and quotes I have. I’m not certain if that was from a written or a verbal quote of Rollo May. Thank you for checking in and sharing on this post. Blessings!